Beautiful Hamptons Vacation House with Pool Surrounded by 100+ Acre Preserve! Spacious, light, bright Hamptons Vacation Rental, Heated Pool & Central Air! Fabulous country Sag Harbor retreat tucked on a cul-de-sac on over five acres and surrounded by natural preserve land, yet central and convenient to all the Hamptons lovely villages-- East Hampton, Sagaponack, Bridgehampton, Montauk and of course the glorious ocean and bay beaches! Patios, lawns, gardens, a heated pool, screened porch, this house has it all along with lots of privacy! Our comfortably elegant, sunny, bright, clean and spacious vacation home with heated pool, lovely landscaping and central air-conditioning was designed with the help of an architect and has been tastefully decorated with a fresh, Hamptons aesthetic. Newly refinished hardwood floors, nine-foot ceilings throughout the first floor, and many windows, the house is beautiful, light, airy and welcoming. An ideal place to escape the pressures of the city--and retreat from the bustle of the Hamptons in the high season--the house is situated in Sag Harbor and centrally located and convenient to East Hampton, Sagaponack, and Bridgehampton but also tucked away on five wooded acres toward the end of a cul-de-sac, adjacent to hundreds of acres of preserve. A gracious living room with 50' HD Flat Screen TV with cable, excellent wireless high-speed internet, wireless sound system, a fireplace and baby grand piano opens out through two sets of French Doors onto a screened-in porch, and into a lovely great-room--a kitchen and dining room that comfortably seats up to ten people. We also comfortably sleep up to ten people in four spacious bedrooms as well as a separate TV room/guest room on the main floor. The master bedroom has a king size bed, cathedral ceilings, and its own sitting area. The main guest bedroom has another king size bed. Two additional spacious guest rooms include one with a queen and a twin and one with two twin beds. Luxuriate in the lovely cotton sheets and duvets. The cook's kitchen is fully equipped, and the separate TV room with a second HD-Flat Screen TV on the main floor can be closed off and used as a spare bedroom if desired. The house offers many places to gather for conversation or games, as well as nooks to relax alone with a book. We have WIFI with cable wireless internet access, so bring your laptop or smartphone and stay totally connected. Outdoors the house has an expansive lawn and gardens, a lovely patio with a Weber Gas Grill, a lounge seating area, and chaises by the heated pool that is fenced separately from the house. For children, we also have a swing-set, a play area with toy boxes, books, and a huge Brio train track collection. A high chair and pack'n'play are also available for use. The house is private, off the main roads, but also within easy access to shopping and restaurants, ocean and bay beaches, cultural activities, and recreation including golf, tennis, and walking & biking trails. We have a complete in-house guide to beaches, restaurants, shopping and day trips convenient to the house that we recommend. 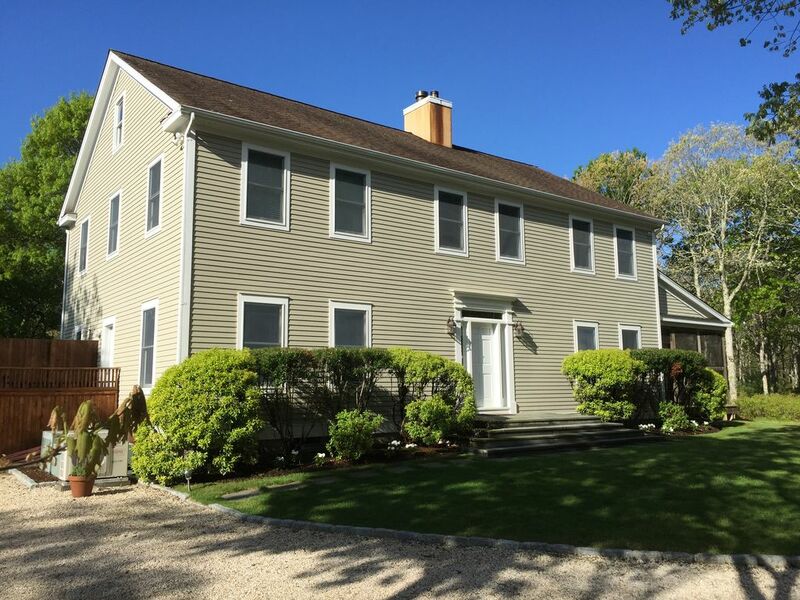 Keywords: Vacation House, Hamptons, Country House, Hamptons Vacation Rental, vacation home, vacation rental, a place to stay, houses, Bed and Breakfast, house rental, ocean. We welcome you to the Hamptons! The house is an idyllic spot: at the end of a cul-de-sac surrounded by hundreds of acres of preserve land, it is private and quiet, but it is also centrally located in the Hamptons, with easy access to Sag Harbor, East Hampton, Sagaponack and Bridgehampton. It is an amazing place to enjoy the Hamptons. We enjoy a spacious, clean, bright and sunny home with lots of privacy. The lawn and gardens and woods beyond provide a beautiful retreat. We love to entertain at our vacation home as the house easily accommodates visits from family and friends and the kitchen/dining and living areas have wonderful flow and offer a very appealing space. toilet, tub, shower, Two sinks, oversized soaking tub. Custom Shower. outdoor shower, Glorious private hot outdoor shower off back entryway. 100% Cotton luxury sheets, pillow cases and duvet covers. Quilts, blankets and down comforters provided in all rooms. Beach and bath towels also provided. Cable High Speed Internet with Wireless Capability. Bring your own lap-top and log-on! Three oversized sofas, two oversized lounge chairs, baby grand piano, 50' HD Flat Screen TV. Gas Stove, dishwasher, side-by-side refrigerator with ice-maker and door ice-dispenser. Dining Room Comfortably seats up to ten. Open with bar to kitchen. Four-Paned Double Sliding Doors to Patio and Weber Gas Grill. 55' HD Flat Screen TV in living room, and an additional HD Flat Screen TV in the TV room. Lovely lawn and garden surrounded by hundreds of acres of preserve land for a truly tranquil and private country experience. Brick Patio with outdoor seating. Separate screened in covered porch with dining table, bar and chaises. Outdoor and Indoor Tennis Available in Sag Harbor and East Hampton. Fully fenced and gated heated 20x40ft pool with patio and lounge chairs. My family and I had such a great time at helens home! Helen was extremely accommodating and her home was beautiful! Everything we could have possibly needed was available and then some. The home is great for a family getaway and plenty of spaces in the home and the outside where we could all sit together. The property is surrounded by lush trees making it super private and a true oasis. The kitchen was fully stocked with everything we needed to cook a big family dinners. There are tons of books in the living room to keep you entertained as well as some puzzles and toys which my daughter loved! I wish we had more time at the property! We had a wonderful stay at Helen's home. Beautiful house and great property, Helen was responsive to all of our questions. Highly recommended! Loved everything about this house! Location, design, amenities. Helen is a super host, she went above prior, during and after to make sure everything was perfect. This is place is great for a weekend getaway. Our group loved this place so much we didn't even feel we needed to leave the property the entire weekend. You have everything here! Our family had a relaxing weekend at this lovely house. The property is spacious, clean and perfectly located. The House is well maintained and very roomy. The outside is landscaped beautifully and the pool is lovely. The owner was very helpful and very responsive if we had questions, etc. We would definitely consider renting again. A lovely home and a fabulous, private location with so many walking trails near the house, and yet so close to Sag Harbor Village. It was a great pleasure staying here with family! Ocean and bay beaches, hiking and walking trails, fishing, surfing, boating, bicycling, wildlife sanctuary, bird watching, excellent restaurants, night-life, cultural activities including theater (Guild Hall and Bay Street Theater), whaling village with historic homes and museums, lectures, book stores and art galleries. Our house is a fabulous Sag Harbor vacation rental in the Hamptons! We prefer to start rentals on weekdays--Mondays, Fridays, etc, rather than weekend days (Saturdays or Sundays). Check-in time is 5 pm and check out time is 11 am. We cannot accommodate parties, events or additional guests on the property. We request that tenants keep outside noise levels low after 11 pm. The total number of people is limited to 8-10 and the number of cars to 4. Please note that propane gas for the pool heater is pro-rated based on tenant's actual usage and deducted from the security deposit. Tenants may choose to use the heater as much or as little as they prefer. We ask tenants to respect the contents of the house and refrain from moving or rearranging furnishings. We ask that tenants leave the house neat and clean, with beds stripped and sheets and towels put through the laundry. We do not allow pets or smoking on the premises. To contact me (the owner) directly to discuss questions about the house and terms of rental and payment prior to booking, please return to the main listing page and click "Ask Owner a Question" on the right side of the page under the orange "request to book" icon, and I will respond promptly to email questions.